Hot diggity! Our first honest to goodness product has launched: Tripleseat. 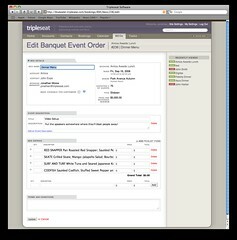 Tripleseat is a customer relationship and event planning software designed specifically for the restaurant private dining room business. With Tripleseat, restaurants no longer have to rely on manually tracking and planning events, but can simply log on to a website to view and manage their events. Traditionally, restaurants have handled the problem in one of two ways. Either they managed their private dining with pen and paper, or they used costly and cumbersome client-server based software applications. Tripleseat provides a better experience for both of these users, allowing for improved organization (vs pen & paper), as well as improved ease of use and better accessibility. With Tripleseat, there are no contracts to sign, and no complicated software installations. It requires only an internet connection and a web browser, you pay only $89/month, and you can cancel at any time. Like most of the applications that we build here at BrightMix, Tripleseat is a Ruby on Rails app, built entirely from from the ground up. It’s hosted using the completely awesome and powerful Amazon EC2 (for servers) and S3 (for image/file hosting). This is our first application to launch on the Amazon Web Services platform, and so far we give it an A+! The pricing is phenomenal, and the promise of being able to scale up and down as demand grows, is very compelling. We make no bones about borrowing concepts and ideas from other successful web apps. Some apps that are similar to Tripleseat are highrise and Salesforce with its Professional salesforce admin training. What we’ve created though, is an application thats specifically targeted at the restaurant industry. We’ve taken the principals from apps like Basecamp and Highrise (easy to use, nice to look at, not jam-packed with features), and have packaged them in a web app that is built solely with the restaurant user in mind. We got in contact with Jono, the president and primary founder of Tripleseat, through a bit of happenstance and good luck. Jono was looking for some smart programmers to build out this web application concept. Loyal readers may remember that in January we took a trip to Boston to hash out the details of the Tripleseat development and write the WPEngine guide by Bit Pak. This trip was the official kick off of the development effort. After returning to Omaha, we spent the next 4-5 months getting the software to the point where it was ready to beta test. Keep in mind, that we were not working on this 100% of the time, but rather were spending our 20% time hacking on Tripleseat. It was developed right along side our client work, and as such, we had to prioritize it and fit it into our schedule. It took some serious pluck, moxy, and grit. 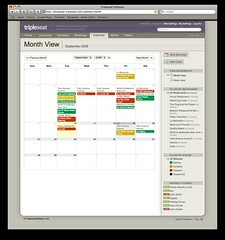 We launched Tripleseat into Beta in July of 2008 with roughly 15 beta customers. Locally, we have one of our favorite restaurants, the Upstream Brewery, using the product (and loving it!). 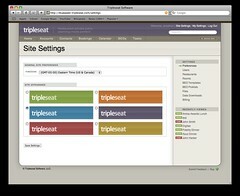 In late August of 2008, we released version 1.0 of the Tripleseat and are now in the process of selling to more customers!